Mike Cowper of Martinsville, Indiana; Kimberly Hinds of Indianapolis, Indiana; Rensselaer Polytechnic Institute of Troy, New York; EasyStreet Realty of Indianapolis, Indiana; Drohan Management of Reston, Virginia; Metal Markets of Indianapolis, Indiana; Mattison Corporation of Indianapolis, Indiana; Industrial Heating Equipment Association of Taylor Mill, Kentucky; Junk Dawgs of Indianapolis, Indiana and WRTV of Indianapolis, Indiana. Mr. Bell is both the copyright lawyer and Plaintiff in this lawsuit. Bell is a copyright attorney and a professional photographer. He contends that he is the owner of two copyrighted photographs of Indianapolis taken in March 2000. The photos have been registered with the U.S. Copyright Office. Bell asserts that he has already suffered, and is continuing to suffer, irreparable injury as a result of the alleged infringement of his copyrighted photos. Bell asks the court to declare that the Defendants’ conduct in using his photos violates his rights under Indiana law and the Copyright Act and asks the court to enjoin further infringing uses of his photos. Among other remedies, he seeks treble damages under Indiana statutory authority. He also asks for an accounting of all gains, profits and advantages derived by Defendants as a result of the alleged infringement and for the maximum allowable statutory and/or actual damages for each violation. Plaintiff also seeks reimbursement of costs and reasonable attorneys’ fees. Practice Tip #1: The claims of this case appear calculated to trigger the “advertising injury” clause of many general business liability insurance policies. If a defendant has applicable business insurance, this may allow Mr. Bell to negotiate quicker settlements. Overhauser Law Offices, publisher of this Site, counsels clients on insurance coverage for insurance claims. Practice Tip #2: This newest complaint initiates the latest of three ongoing cases filed by Mr. Bell asserting infringement of his photos. We have blogged about his copyright infringement litigation before. See here. 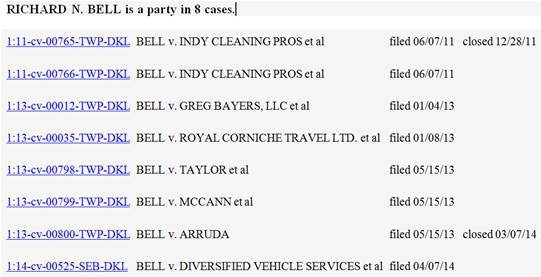 The Indiana Lawyer also wrote today about Mr. Bell’s copyright infringement lawsuits. See here. The Indiana Business Journal ran a similar piece. Those articles include an interview with Paul Overhauser, Managing Partner of Overhauser Law Offices. The suit was filed by Richard Bell of McCordsville, Indiana. The case was assigned to District Judge Sarah Evans Barker and Magistrate Judge Denise K. LaRue of the Southern District of Indiana and assigned Case No. 1:14-cv-00525-SEB-DKL.